SIGNificant Click-2-Sign offers an alternative means of identifying signatories where signature pads are not present, typically for internet-based purchases. Click2Sign also maintains the signing audit trail with the signed document, which makes these documents legally binding. The most sophisticated identification method is the PIN-by-SMS functionality. The user signs on the web using a PIN code that has been sent to a user-specified cell number. 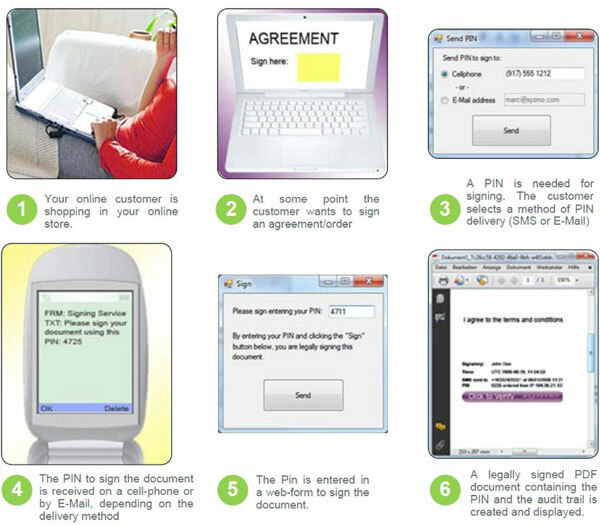 Click2Sign logs all the steps, from the sending of the PIN code to the entry of the PIN into the website, into an embedded audit trail, assuring that the signer is the holder of the specified cell number. This method is used today by wireless providers who know their customers’ cell numbers. The PIN-by-e-mail method works the same way as PIN by SMS, except that the PIN is delivered to an e-mail account rather than a cell number. This method is useful if e-mail addresses are known upfront. Click2Sign provides a configurable blacklist for e-mail domains, so known SPAM domains can be avoided. The user signs by entering his name instead of a PIN. Optionally, the name can be provided to the authentication system by a backend system for comparison. The audit trail will show what the user entered and from where. The user signs by clicking an ”I agree“ checkbox. The audit trail will show when the user clicked “I agree” and from where.